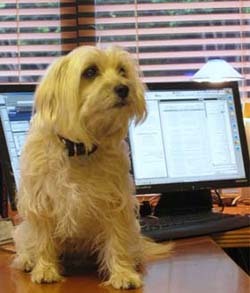 Jimmy is on the job providing attention and TLC to clients and staff alike. He's a veteran pup of the industry. Claudia handles all escrow transactions exclusively for the Brachman Group. A licensed agent, as well as a veteran real estate investor, Claudia has managed several properties and overseen her own remodel projects. As such, she is experienced and adept at managing the myriad details that accompany the escrow process, thereby ensuring a smooth process for our clients. Wayne brings more than 15 years of marketing and management experience to the Brachman Group. Having purchased and remodeled two of his own homes, he has an intuitive understanding of residential real estate and homeownership. Wayne is a talented, widely known milliner. His hats are included in the San Francisco deYoung Museum Textile Collection and the Seattle Museum of History and Industry. James keeps The Brachman Group’s office running smoothly, handling critical administrative details and managing multiple tasks with meticulous attention to detail. He is accustomed to meeting deadlines in a fast-paced environment while providing excellent customer service and communication.